Speaking about the Ferrari, we usually mean something more than just a luxury car. For many of us, this brand - the legend created by one brave man. For more than fifty years of Ferrari cars left far behind all its competitors. Created by Italian Enzo Ferrari back in the 40s, they still command respect and admiration. It started it all with the dream of a little boy whose father more than once took with him on insurence. That's when Enzo and decided to link their lives with motorsports. At the age of twenty years immediately after the First World War, he is hired to work at CMN motor companies as a test rider. After working there for two years, he quits and goes into the then small and little-known company Alfa-Romeo, race cars which are considered quite promising and interesting. In the postwar years, Italian automotive industry has developed very rapidly. And Enzo Ferrari it was a great chance to realize his dream - to create their own racing team. So, in 1929, Scuderia Ferrari appears in Modena, in the creation of which the young Italian helped his friends and partners - Alfa-Romeo, with whom he continued his cooperation. Scuderia in Italian means "stable", the young Ferrari logo was chosen appropriate - rampant horse on a yellow background. Interestingly, the history of the emergence of this emblem is quite simple. At the time, a rearing horse decorated fighter Francesco Barakki, ace of the First World War, who died heroically at Montello. In 1923, during one of his speeches on the track Enzo met with the parents of the pilot - Count Enrico Baracca, and his wife. They offered to the young man to portray the horse reared on his race car. "He will bring good luck," - then added the countess. And I was not mistaken. Enzo Ferrari for all subsequent years kept a photograph of a young pilot, he passed Barraca family. Entrusted to him the emblem he left unchanged, adding only gold background - color Madeny city. Over 30s Scuderia Ferrari Alfa-Romeo performed a representative, but soon decided to establish their own independent and production cars. The outbreak of World War II stopped Enzo Ferrari plans, and the company was forced to work on military contracts. But immediately after the completion of the Italian war again started the implementation of their plans. So, in 1946 the world saw the first car created by him - Ferrari 125 other than the 12-cylinder engine made of aluminum and is a combination of road and racing performance in one machine. A year later, comes an improved modification of the Ferrari engine, as well as created the company Auto Avia Construzione Ferrari, whose purpose - the production and sale of sports cars. Machines produced by Enzo Ferrari, are winning victory after victory on a variety of races. The brand is becoming more successful, and sales of cars continues to grow. In the mid-50s is beginning to gain popularity is racing like Formula 1. In 1952 and 1953 the famous driver Alberto Ascari on the sports car Scuderia Ferrari wins in this competition that makes the Ferrari brand is the best known and most desirable in the automotive world. By the mid 50's Ferrari company produced already 250 racing cars and road 200 - for those who are important combination of speed and convenience. Enzo Ferrari does not remain on the sidelines and from community activities - it creates an engineering school, building trails. Around the same time began to appear, and the company's competitors - Lamborgini, Lotus, Mazeratti, Porsche. They periodically bypassed famous sports cars in those or other characteristics, and sometimes tore their victory in the race. But the leadership in the majority of cases continued to be for Ferrari. Remarkably, Enzo Ferrari never resorted to advertising their cars, creating a brand solely on quality. We can not say that the history of the brand Ferrari has never been marred. Car race can not do without tragedies, and more than enough, both for the company and for its creator. So, in the 50's killed a well-known racer Alberto Ascari, which is thanks to the participation in the Formula 1 Scuderia Ferrari and acquired its worldwide popularity. Following this death overtook Ferrari Dino - 20 olds son Enzo. Later on the car Ferrari 246 crashed one after the other 2 pilots, whose death was no less tragic. Enzo Ferrari himself is considered to this day one of the kings of the automotive industry. During the years of his leadership of the company Ferrari team has won more than 5 thousands of races, winning 25 World Cup. He died in 1988, noting his ninety-year anniversary. After the death of the great Italian Ferrari went to the FIAT Corporation, which at that time had already owned 50% of its shares. And even though the company's founder is no longer at the helm, Ferrari still remains one of the most expensive automobile brands in the world. Team Ferrari and more wins victory. Thus, from 2000 to 2004, the famous racer Michael Schumacher for four consecutive years won the world championship car Ferrari. Continue to create more powerful and fast cars, which do not leave anyone indifferent from motorists. 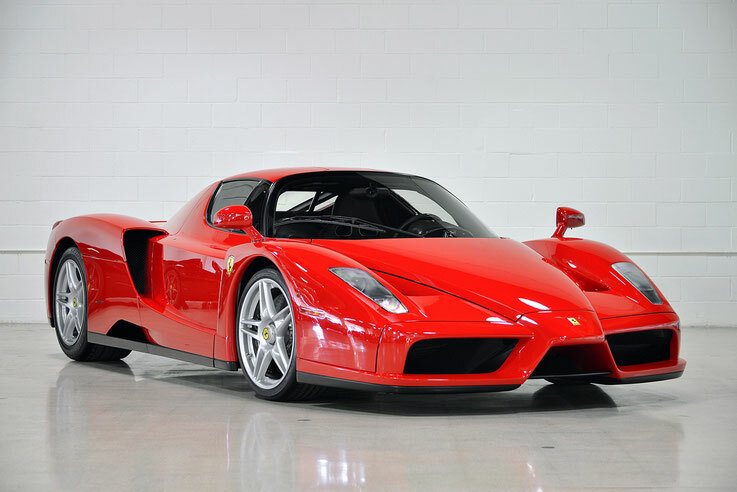 One example of this was the special model Ferrari Enzo, presented in Paris in 2003 and is recognized at the time the most powerful of all production vehicles in Europe. Named in honor of the great designer, she is the embodiment of all the best of what the company has achieved a more than fifty-year history of the legendary brand.